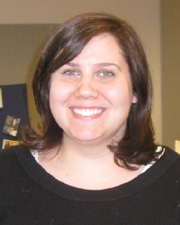 Audrey joined the Dole Institute staff as Senior Archivist in August 2012. She is a proud fourth-generation Kansan and a KU graduate, having earned a B.A. with distinction in Spanish, 2001, and an M.A. in Museum Studies in 2004. Audrey is a Certified Archivist active in the Society of American Archivists as a member of the Congressional Papers Roundtable Steering Committee. She is also Co-Chair of the Midwest Archives Conference 2014 Local Arrangements Committee and a 2013 appointee to the Kansas State Historical Records Advisory Board (KSHRAB). Prior to joining the Dole Archives, Audrey served as Manuscripts Processing Coordinator at KU’s Spencer Research Library, and as Assistant Curator of the Visual Resources Collection in KU’s Art History Department. Audrey and her husband, Dan, live in Lawrence with their two children. Sarah holds a B.A. in Art History from the University of Mary Washington in Fredericksburg, Virginia, and an M.S.I.S. with a specialization in Archives and Records Enterprise from The University of Texas at Austin. She was awarded certification by the Academy of Certified Archivists in 2011. 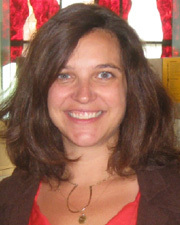 Sarah is active in the Society of American Archivists Congressional Papers Section (CPS) and Association of Centers for the Study of Congress (ACSC). She serves on ACSC’s Scholarship Committee and Digital Exhibit Taskforce, and serves as CPS newsletter editor. When she's not archiving, Sarah can be found watching reality television with her husband and dog. A native Kansan, Julie was proud to join the Dole Institute in 2015. As the public education coordinator, she leads K-12 and family education programs at the Dole Institute of Politics, including on-site, outreach, and online initiatives. 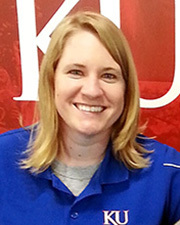 Julie graduated from the University of Kansas with her Bachelor’s and Master’s degrees in biological research. Most recently, she was an education specialist at the Natural History Museum of Utah and traveled all over the state teaching outreach education programs to thousands of students every year. She is excited to share her passion for effective and innovative education utilizing primary sources from the Dole Archives and Special Collections. Online resources and interactive features with historical material documenting Dole's 1976 Vice Presidential campaign.